Some of the remaining buildings. One the left in the back is the cookhouse, the smaller building on the left in front of it is the storage/ice house. Slightly visible on the right is the commissary. 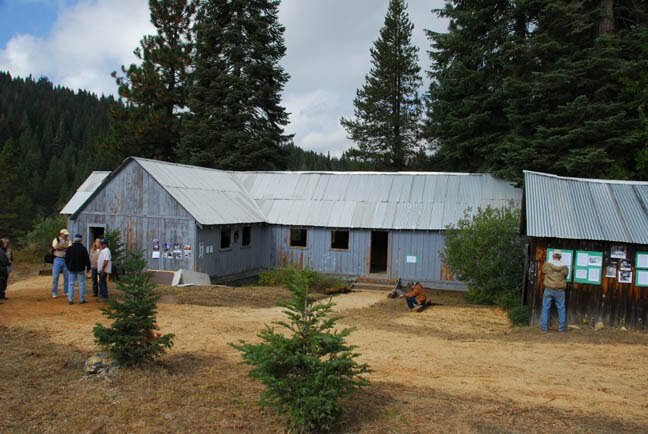 Pine Logging Company constructed this commissary building in 1942 to provide a convenience for the employees. An independent contractor always ran the commissary and Lloyd Leach was the first to set up operations in the building. His father Owen was the millwright at Pine Logging. Other family members of employees worked in the store over the years, including Elsie Boatman, and Esther Hamilton who was employed by Mr. Ivy in the 1950’s. 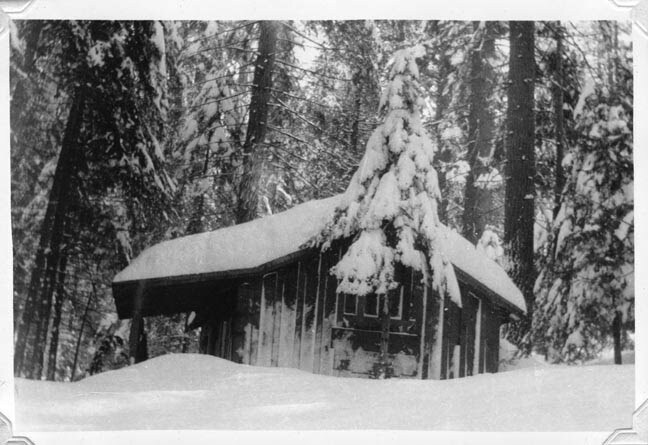 At that time the commissary was under the management of Mr. Ivy who also owned “Ivy’s General Store” at Shaver Lake. Beer and soda, candy, and tobacco (chewing, Bull Durham, and cigarettes) were the first items offered for sale, but gradually more products were included and so by the 1950’s it was a small general store selling everything from magazines and Levis to bread, canned goods, ice cream, personal items, magazines and even a small selection of meat and vegetables. Because most families made trips several times a month down to the valley to shop for provisions the commissary mostly operated as an early day “7 – 11” convenience store, except for the beer. The smaller room on the side of the building was a gathering place for the men to have a cold beer at the end of the day. Children were not allowed in that room. Prices for most items cost more to purchase at the commissary than the same product down in the valley because transportation costs, then as today were considerable. 1955 was before air-conditioned cars and the four-lane highway up the grade. The commissary operator drove to the valley for supplies and also relied upon supplies to be delivered weekly by the Huntington Stage. Despite the exotic name, “the stage” was not horse powered but rather a big diesel truck that delivered supplies throughout the mountain area. Take note of the foundations, probably not acceptable by today’s building code. Francis Emmert, Lloyd Leach and a hired hand built the commissary building. Recently Mr. Emmert pointed to one of the granite rocks and commented that they’ve held up pretty well over the years. The cook, cook’s helper, dishwasher, and two servers kept the cookhouse running for three meals a day using a wood cook stove and washing all the dishes by hand. Breakfast, lunch and dinner at the cookhouse were always hot meals, plentiful, and always including a platter of meat and a serving of potatoes and a serving of beans. All meals were served family style with the bowls and platters of food placed on the table before the men entered the building, and then replenished during the meal. In 1955 men were charged 90cents/meal and that charge was deducted from their paycheck. A chart with the men’s name was posted by the door and as the men exited the cookhouse they made a mark by their name for each meal. The actual cost of each meal in labor and supplies was about $1.80. The tables in the center of the room nearest the kitchen were those used first, more tables to either side of the center table were set up depending upon the number of men who were being served. Look for a trail of cork boot holes in the floorboards by the entry door midway down the length of the eating area. The “company table” was the end table on the west side, to the left from the kitchen. Management sat at that table, including Leo Chase the bookkeeper, John Carroz in charge of trucking, Mr. Rohrbaugh, and Mr. & Mrs. Grimmett. The Grimmett granddaughters always ate at the company table the few lucky times they were there with their grandparents or parents. The Grimmett grandsons started out eating at the company table when they visited, but after awhile once they started working it was suggested by their grandfather that they move to the working men’s table. Although there was no assigned seating the men tended to sit together at tables based on their jobs; for example the woods crew, the mill crew, and the truck drivers. The men also settled into their ‘own’ places at each table and that was quickly clarified for the newcomer. Ask Rich McMahan about his experience as the new man at the woods crew table. Read the Christian Science Monitor article for a reporter’s view of the cookhouse as it was in 1956. Meat: bacon, or sausage, or steak, or pork chops, etc. The office was the domain of the bookkeeper, Leo Chase and it was here that he handed out paychecks twice a month on the 10th and 25th. By 1955 Leo had already worked for Pine Logging for almost 20 years and when Mr. Grimmett was not present he was the highest authority on the job. Leo did a remarkable of keeping all the records of the day-to-day business, the timekeeping for the whole crew, the payroll, and he also oversaw much of the overall management of the camp. Leo was also a personable fellow and when salesmen, job seekers, or whatever sort of visitor showed up Leo always had time to interrupt what ever he was doing to talk and often even take the visitors on a tour of the mill. Originally Pine Logging Company was a partnership between Robert Grimmett and Jim Rohrbaugh; by 1955, however, Robert Grimmett had purchased his partner’s share of the business making him the sole owner. Mr. Grimmett kept a close eye on all aspects of the business both at the mill at Dinkey Creek and down at the drying yard and planing mill in Fresno. Mr. Grimmett’s desk was in the back room of the office, just steps away from his house. On payday Leo handed out the paychecks, checks that Leo had computed and written and then turned over to Mr. Grimmett to inspect and sign. Mr. Grimmett, also known as “the old man” went over the payroll, check by check, to be sure that no one was making too much money. Most employees were paid by the hour and worked a steady 8-hour day, 6 days a week. Some of the woods crew, however, was paid by piecework depending upon the size and number of trees they had fallen and limbed, these paychecks were always especially well scrutinized. 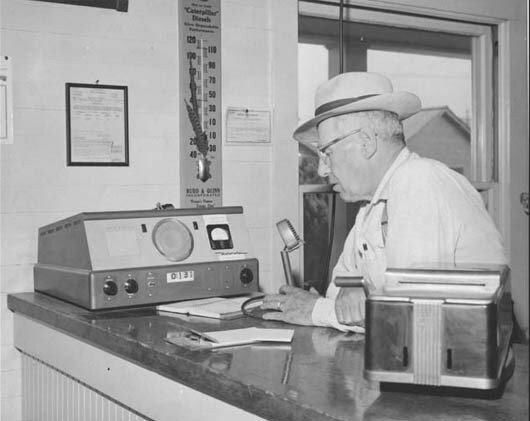 By 1955 a two-way radio was installed for communication between the office at the mill and the office in Fresno enabling Leo to keep in good communication with the Fresno office and his boss, and visa versa. For the first ten years or so there was no radio communication between the Dinkey mill and Fresno. 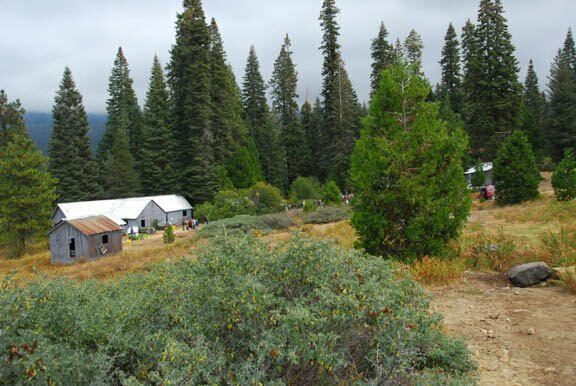 Since there were no telephones at the camp, any emergency communication from outside happened by calling the office in Fresno and that message was then radioed to Leo, who then gave the news to the Pine Logging employee or family member. Leo stayed pretty close to the office, so when he pulled up in front of a house in the middle of the day no one expected to hear good news. Leo also distributed the mail. Attached to the front of the old office building was a set of alphabetically marked cubbyholes. Personal mail for the employees could be sent to the Fresno office and everyday it was then sent up in a bag on a lumber truck returning up the hill to the mill. The mailbag was given to Leo who then distributed the mail into the boxes. Because the boxes were open, items such as colorful postcards could catch the attention anyone collecting their mail and so could be easily admired. It was possible to have mail sent to the small US Post Office at Camp Ducey. That address was simply, for example, John Doe, Dinkey Creek, Calif. The post office was in a small office in the general store and Mrs. Parker managed both store and post office. When one walked into the store Mrs. Parker would recognize the person and walk over to the Post Office and fetch the mail. Mr. & Mrs. Grimmett lived in their first cabin for about 15 years. It was a two-room cabin that has since had a bedroom added to it, the bedroom to the west nearest to the cookhouse. The cabin had running water in the kitchen and in the 1940’s electricity was added and a small addition that contained a shower. 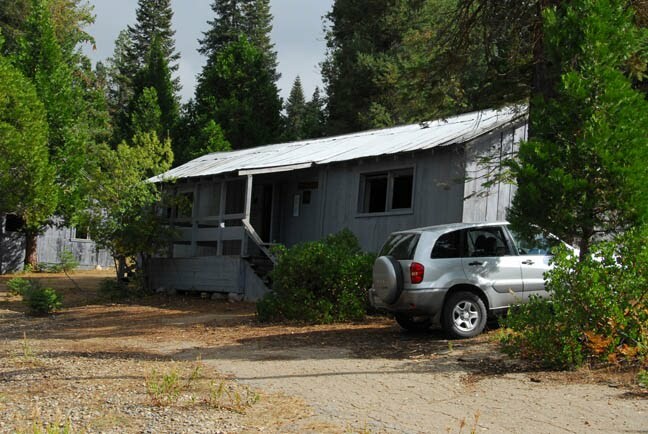 This cabin still stands and is located just across the road and down the hill from the ‘new’ Grimmett cabin. Built in the early 1950’s, this new house replaced original Grimmett cabin that still stands downhill just across the road. Like all cabins, it was heated with an oil barrel wood stove placed at the end of the living room. Unlike other family cabins, it had no kitchen. On opposite end of the room were a sink, small refrigerator, and hot plate. By the time this cabin was built Mrs. Grimmett decided that she had cooked enough meals in cabins and so Mr. & Mrs. Grimmett and guests ate all their meals at the cookhouse. Mr. Grimmett’s bedroom and a guest bedroom were at the far end of the building behind the wood stove. Mr. & Mrs. Grimmett had two grandsons who spent their teenage years working around camp and in the woods. At first they stayed in the guest bedroom. Later on they took up residence in a tent platform that was built for them just up the hill. Apparently there had been some discussion about getting in late at night, especially during the workweek. Mr. Grimmett had keen hearing. Long summer days and no television led to some creative pranks, and some not so creative. Rich McMahan’s cousin played one such prank on him when she hid his work boots under his mattress when he was away one evening. This was a thin mattress set on a metal bed frame in the tent platform. Rich complained to his cousins for almost a week about not finding his boots before they finally told him to check his bed.